PHIL CLEARY is an author, broadcaster, former Federal politician and an outspoken commentator on politics, sport and a range of social justice issues. Phil’s connection to Family Violence is intensely personal having lost his sister at the hands of her former partner. LONI COOPER is a journalist with more than ten years' experience in radio and television. Having worked as a researcher on ABCTV's Media Watch and as a freelance producer and presenter with ABC NewsRadio. ​Amongst her current roles, Loni is the editor of Uncovered, a resource developed by journalists for journalists to improve their understanding of the complexities of violence against women and their roles in changing attitudes to and around the issue. ASSISTANT POLICE COMMISSIONER ROSS GUENTHER was a musician before he joined the Police Force. At one stage Ross moonlighted in the band for Frankie J Holden's TV show In Melbourne Tonight. 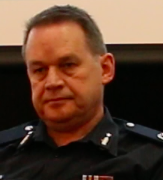 As Superintendent, Ross established Taskforce Alexis to provide a holistic service to deal with Family Violence incorporating police, social workers, mental health professionals and others because, as Ross said, 'We know that we can’t arrest our way out of the problem and we need to focus on prevention'. Now, Assistant Police Commissioner, Ross is responsible for Counter-Terrorism – not just in the home but, now, across Australia, in the broader sense of the term. Our final panellist is VAN BADHAM, author, feminist, Guardian columnist, social commentator and the undisputed and fearless queen of one-liners. Which of us will ever forget how Van shut Steve Price down on Q&A when he accused her of being ‘hysterical’ with her sardonic comment, ‘It’s probably my ovaries making me do it, Steve’? The unedited footage of the discussion can be downloaded here.